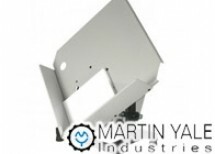 Martin Yale Industries has been at the forefront of office and mailroom equipment since its founding in 1940. With more than 75 years of experience, they have solidified their role as an industry leader. Whether you need a solution to streamline your mail room or a folding machine to fold stacks of paper within minutes, you have come to the right place. 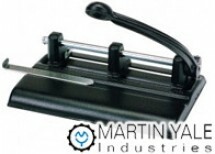 Binding101.com's selection of Martin Yale office equipment includes a wide variety of padding presses, folding machines, hole punchers, paper joggers, and sorting machinery. Explore our selection today to find the right solution for your business while staying true to your budget. When you spend $75 or more, your order can qualify for free shipping. We offer a broad range of paper folding machines that are ideally suited to schools, small offices, mail rooms, and quick-print stores. 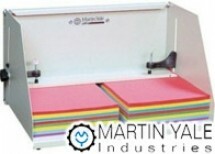 These folding machines range in size from a small single sheet to 500 sheets. You can narrow your search from the start by sorting price, suggested use, operation, and more. Available fold types include letter folds, half folds, Z-folds, double parallel folds, and gate folds. Sheet size capacity ranges from 8.5” x 11” to 12” x 18”. Manual collators eliminate the need to count out documents by hand and assemble them into groups. 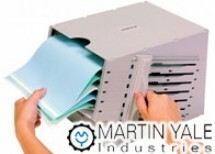 Discover the difference that a paper folder can make by exploring our Martin Yale office equipment collection to find your solution. Binding pads of paper laborious, but you can avoid wasting time and energy by investing in the right equipment for your operation. 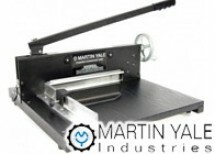 We offer an array of Martin Yale tabletop or standing padding presses. Padding machines such as these make it easier to create professional carbonless forms, notepads, scratchpads, and more. Each press is constructed from metal for durability and features a large tray for padding thick stacks of sheets at a time. Finish your documents in a professional way with the help of a heavy-duty paper cutter and hole puncher. All in-stock Martin Yale office equipment will generally ship within one business day, so you can eliminate wait time and stick to your production schedule with total peace of mind. Customer satisfaction is of the utmost importance to us. By choosing us, you gain much more than high-quality binding equipment. Our customer service professionals are trained extensively and available to answer any questions or concerns you may have. Contact us today for more information or further assistance.